Calling all kids: lights, camera, action! You may be a proud grand who thinks your grandchild “ougha be in pictures,” because you see that same preteen flourishing in the spotlight. If so, you might think about enrolling your grandchild in acting or film school. It would give the child real-world, hands-on experience as well as give both of you a souvenir DVD or just good old-fashioned memories to last a lifetime. Lots of grandparents enroll their grandkids and pay for the tuition. This has less to do with becoming a “star” and more to do with giving kids the opportunity to develop their creativity and self-esteem, as well as becoming comfortable and confident in pressure situations or performing in front of large or small groups. Of course, students can also apply what they learn to future career plans. 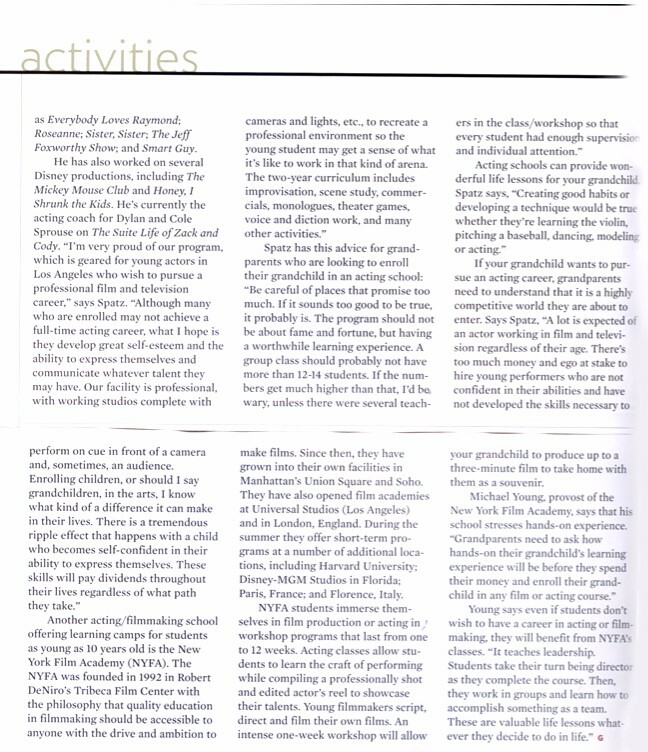 One such acting school is The Playground, located in the heart of the Century City area of Los Angeles and founded and run by Gary Spatz. Teaching acting classes is one of Gary’s primary passions in life. He focuses on creating a workshop or classroom environment that allows the students to take risks and exercise their imaginations. After moving to Los Angeles, Gary studied acting with Paul Sills from 1978 to 1985. Gary was a company member of the respected American Theater Arts in Hollywood, where he continue training, performing and eventually began teaching. For the 15 years after that, Gary taught classes at Young Actors Space. Spatz has been the on-set acting coach on such shows as Everybody Loves Raymond; Roseanne; Sister, Sister; The Jeff Foxworthy Show; and Smart Guy. 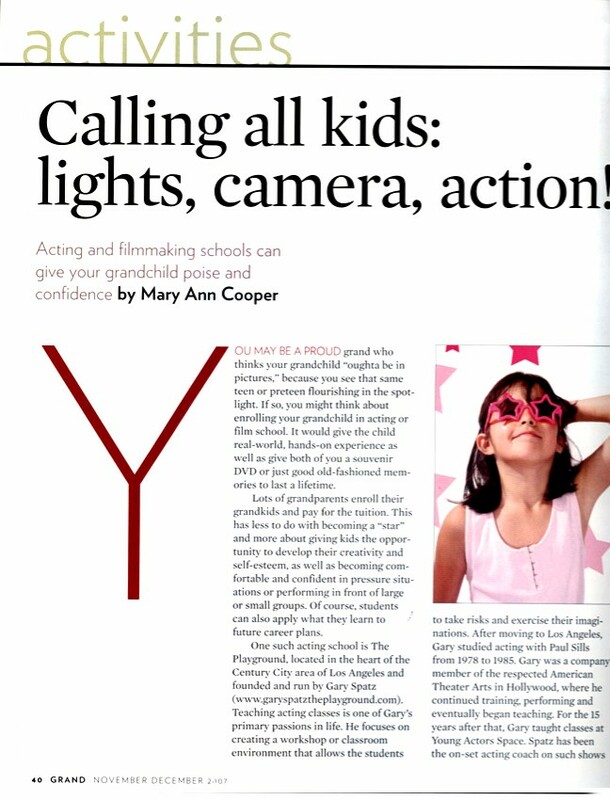 If your grandchild wants to pursue an acting career, grandparents need to understand that it is a highly competitive world they are about to enter. Says Spatz, “A lot is expected of an actor working in film and television regardless of their age. There’s too much money and ego at stake to hire young performers who are not confident in their abilities and have not developed the skills necessary to perform on cue, in front of a camera and, sometimes, an audience.